Brent Remadna – KHON2 Honolulu Hawaii. A fire that burned for hours and left two workers injured has lead the city to take a closer look at how they check for utilities. In February re-surfacing work began on Kapahulu Avenue. The project was supposed to take a little more than a year, but after crews struck a gas line, which resulted in a blazing fire, work has been halted. “This was a freak accident where two lines from the two utilities crossed and so to get over the one the gas line went up and over,” said Robert Kroning, director of the Dept. of Design and Construction. The city does have plans to show where utilities are and even marks them on the road, but they said the plans are old and sometimes not accurate. “It should have been annotated on the plans and somehow that got missed,” said Kroning.”That’s why we are going to make sure we go through more thoroughly.” Since the fire the city says that they are now taking a closer look at the Kapahulu roadwork and other projects as well. “There are crews that are now concerned about other roads in downtown,” said Kroning. “So we are working to do this analysis for all the roads we have concerns where this may happen.” Now instead of just going off old plans the city is taking a closer look. “We are going to get ground penetrating radar to help find the locations to find utilities a little better and not just go off the plans,” said Kroning. As far as when roadwork will continue, that is still up in the air. Kapahulu road work fire raises concerns. 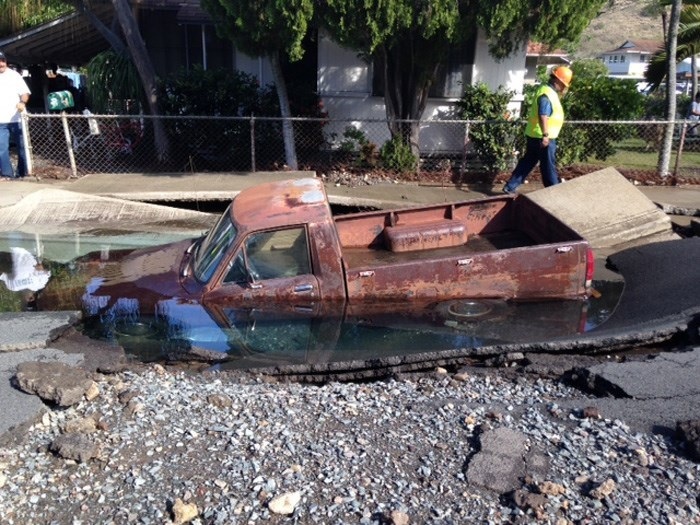 Sinkhole swallows pickup truck while crews respond to water main break in Palolo Valley. By Ramsay Wharton – HawaiiNewsNow Honolulu, Hawaii. BWS- Board of Water Supply crews are responding to a 16-inch water main break and sinkhole located on 10th Avenue and Hinahina Street. The water main break, which was reported Thursday at around 6:05 a.m., ripped up the sidewalk and buckled the road near the sinkhole. Neighbors were urged by police to move their vehicles, but a Ford pickup truck was located right over the gushing main break, and in a matter of minutes, the truck collapsed into the roadway, uprooting the adjacent sidewalk. Honolulu police said they tried to get the truck out of the way before the road collapsed, but were unsuccessful. As of 8:30 a.m., the truck was still submerged in the sinkhole. However, no injuries have been reported. The truck owner’s wife, Sala Costa, said she believes the truck and its collapse ultimately saved more water from causing damage to the couple’s home on the corner of 10th Avenue and Hinahina Street. She said the sound of rushing waters woke her up. They couldn’t escape their front yard gate because of the water coming into their yard. Costa said she managed to climb over the fence with the help of police and firefighters. Water has not entered the home, but their garage is flooded and damaged some of their property and a shed in the back, she said. A similar water main break occurred about eight months ago and caused about $100,000 of damage to their home. They also just finished relaying new grass in their front yard, Costa added. “Our whole yard was flooded and in fact, they just got through putting in new grass in the yard a week ago,” she said. BWS crews managed to shut off the water at 8:20 a.m. Approximately 23 customers have been impacted by the water main break. All lanes on 10th Avenue, between Hinahina Street and Hardesty Street, will remain closed. Repairs are expected to continue throughout the day and into the evening, BWS said. Sinkhole swallows pickup truck in Palolo Valley – 2015 Hawaii News Now.